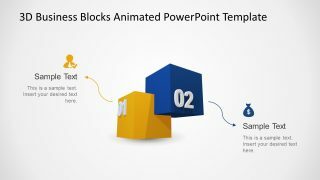 Animated 3D Multiple Arrows Crossing Wall PowerPoint Template – A set of five slides to discuss business strategies. 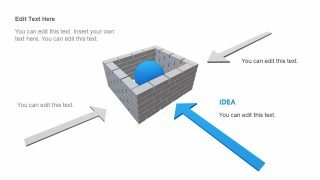 These slides show two 3D model designs of brick walls with circular shape illustrating goal. It further includes 3D arrow shapes representing ideas i.e. alternative solutions to achieve a specific objective. 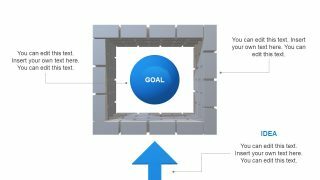 Ideally, visual presentation of arrows crossing the wall illustrates hurdles while reaching targets. But these slides can use additional graphics or text material to display strategies for clearing these hurdles. 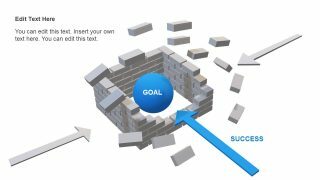 Therefore, 3D template of multiple arrows crossing wall can help presenter to express views on project planning or strategic analysis. Such as competitive analysis of a company, its success rate, and goal achievement. The Animated 3D Multiple Arrows Crossing Wall PowerPoint Template is an editable slide deck. 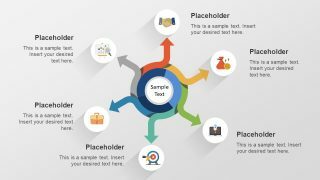 It means users can modify design properties of this template. Such as resizing, copying or inserting more graphics, changing text or background colors etc. However, there is one limitation in editing 3D models, the colors. 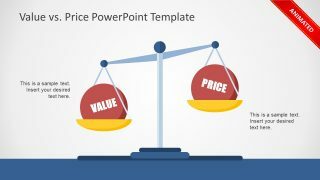 Although PowerPoint does not have option to add colors in 3D-graphics, users can take advantage of applications like Paint 3D. 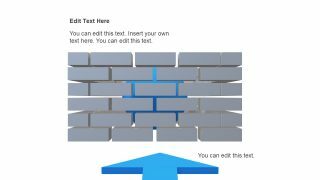 For example, import 3D wall shape in Paint 3D and use brush tools for customization. Follow the same method to edit 3D arrow graphics of this template. 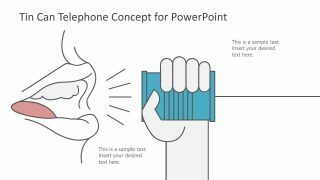 Furthermore, the slide transitions and animations create an effective video-like visual of presentation. 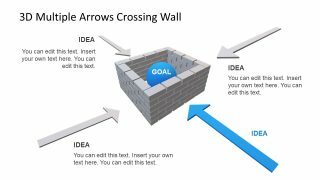 Alternatively, download a similar 3D arrow crossing wall concept PowerPoint with one-slide wall design. The animated PowerPoint of arrows crossing wall concept benefits business professionals. These slides assist in creating a convincing visual to discuss project planning and its challenges. An arrow breaking the wall depicts success. However, arrows crossing a wall usually portray stocks and financial break-through reports. Hence, the multiple arrows crossing wall can assist professionals in stock-exchange and banking industry to highlight their analysis.